As the digital world continues to evolve, there’s still a desire for authentic human connection. It doesn’t matter if it’s friendships, romantic relationships, or in business. Sometimes people just want to hear your voice instead of firing off an email. Especially if they’re thinking about giving you money. Smart marketers continue to rely on the telephone—even though the technology is considered “old school”—as an important part of their lead generation strategies. But integrating the telephone with online lead-generation and sales systems isn’t always seamless. Unfortunately for a lot of businesses, these growing pains result in a lot of leads and customers left on the table. It doesn’t have to be difficult for you, though. 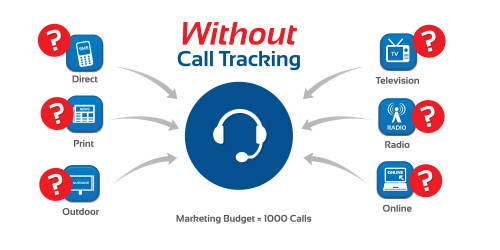 You can implement call tracking technology to find out more about your marketing efforts, improve your customer experience, and optimize your budget across every channel. Offering users multiple ways to get in touch is a simple way to boost your conversions. Some users prefer contact forms; others are more comfortable with email. Some will want to pick up the phone or even drop by. You can’t predict how all of your target customers will reach out to you. And that’s okay… as long as you’re giving them options to choose what’s most convenient for them. Because some people prefer to pick up the phone, it makes sense to give them that option. And there are other important benefits besides user preference: research from the Stanford Persuasive Technology Lab found that displaying your phone number on your website (and making it easy to find) increases your perceived credibility. And phone calls remain the most consistent source of high-quality leads. BIA Kelsey reported that 66% of sales managers consider the telephone to be their highest-quality lead source. So giving people the option to contact you on the telephone offers plenty of benefits. But there are potential pitfalls too. The biggest downside to generating leads over the telephone? A lack of information. This information gap can lead to poor business decisions, blown budgets, and plenty of missed opportunities. Which brings us to the online marketer’s dilemma. You can’t afford not to field phone calls because it they’re such a rich source of high-quality leads. But it can be a nightmare figuring out where those leads are coming from. Tracking leads generated online is straightforward. You check your analytics data to find out where your leads came from, review their activity on your website, and even find out additional geographic and demographic data. What did you see that drove you to pick up the phone? Asking telephone leads questions like “how did you find out about us?” can derail the momentum of a sale. So many marketers simply keep operating with this black hole in their marketing data. You end up making decisions based on incomplete information. It’s impossible to optimize your marketing budget because, without crucial information about leads generated over the telephone, you don’t always know which initiatives are generating the highest ROI. The concepts above might seem vague. It’s easiest to illustrate them with an example. Say there’s a guy named Darren. Darren is an avid runner fresh off his latest marathon. He’s in the market for a new pair of shoes after he burned all the rubber off his old ones. There’s a business where Darren lives specializing in high-end running shoes. They advertise on Facebook, the local radio, and they have a few print ads at local shopping malls. Let’s say Darren goes to the mall. The banner ad catches his eye at a kiosk while he’s looking for a store directory. After Darren gets home, he notices another ad from the shoe store while he’s playing around on Facebook. This time Darren decides to act. He writes down the store’s phone number from their Facebook ad (without ever clicking it), and gives them a call. It’s great for the business if he buys some high-end running shoes, but they don’t get much info about what happened before Darren picked up the phone. Unless Darren clicks the Facebook ad or tells the phone rep he saw their ad there, the shoe store (assuming they don’t have call tracking) has no way to attribute Darren’s call to it. If there are a lot of “Darrens” out there—and there are, seeing as it takes multiple exposures to a brand before someone will become a customer—this can lead to some incorrect (and costly) assumptions about the business’ marketing strategy. Because they don’t have any way to find out whether the Facebook or banner ads influenced Darren’s decision, the shoe store underestimates the effectiveness of those channels. They might even pull their successful Facebook or banner ads, leaving tons of money on the table over the years. Wouldn’t it be better to get the “big picture” of what’s going on with all of your marketing efforts? Your call tracking provider assigns you a different phone number for every marketing channel you’re operating in. So if you were advertising on Google AdWords, on the radio, and doing direct mail you’d get three different numbers. When a lead calls, call tracking records which number they called. This helps you understand which channels are leading to the most phone calls, giving you a broader perspective on how your marketing efforts are working together—all in one place. One of the most powerful call tracking benefits? It helps take guesswork out of the equation. You get the most impact for every penny you spend because you no longer have to pick “winner” and “loser” marketing initiatives based on incomplete information. Back to Darren and the shoe company from above. With call tracking, each of the shoe company’s marketing channels—Facebook, the radio, and the banner ad—gets assigned a unique phone number. When Darren calls the number listed on the Facebook ad (even though he didn’t click it), call tracking lets the shoe store know that Facebook was the source of the phone call. The lead gets attributed to Facebook—right where it should. Without call tracking, the store wouldn’t have a clue which marketing channel played a role in the conversion. The information you gain from call tracking can help you make the best possible decisions how to allocate limited marketing budgets. Taking phone and online generated leads into account, you get a comprehensive picture of what’s working well and what isn’t. Bottom line: you can funnel your cash into the most profitable initiatives, stop advertising on the unsuccessful ones, and increase the ROI of your ad spend. How much of an impact can these better decisions have? TellurideLodging.com, a hotel company in Colorado, used call tracking to assign unique phone numbers to all of their online marketing initiatives. In just one month, they were able to use the insights they gained to increase their advertising ROI by 340%! Besides the increased marketing ROI, call tracking can help you create a better experience for leads that contact you over the phone. Once you install call tracking, there’s no need to bombard people with questions about how they found you. Many call tracking providers even record conversations between prospects and your sales reps, making it easy to monitor their interactions, spot common sticking points, and make the process smoother. If you’re using a customer relationship management (CRM) tool like Salesforce.com or SugarCRM, you can even find a call tracking provider that integrates seamlessly with your tool of choice. Your sales reps can follow up with leads systematically and push them closer to becoming buyers. And they can do it armed with the extra information call tracking provides. Despite all the advances in technology and new ways to interact with people, the telephone remains one of the most powerful tools in any business’ arsenal. This used to come with tradeoffs: difficulties meshing with online lead-generation strategies, an information gap about phone prospects’ behavior, and the possibility to make poor decisions based on incomplete information. Call tracking changed all that. It’s easy to set up, implement, and apply valuable insights to make your leads happier and make the most of your marketing budget across every channel. But don’t wait too long to get started. In today (and tomorrow’s) competitive online space, a holistic approach—one that combines old and new communication avenues—is vital to stretch limited budgets and achieve long-term growth. Do you use call tracking? If so, how has it affected your business? Share your experience by leaving a comment below! What Is Call Tracking and Why Should I Care? Google’s New Call Tracking Feature – Should You Use It?